Dr. Zoolittle has come across something new in the Zoo and is curious to know what it is all about! Presenting the Weekly Login Rewards, an all new feature do reward all our players! 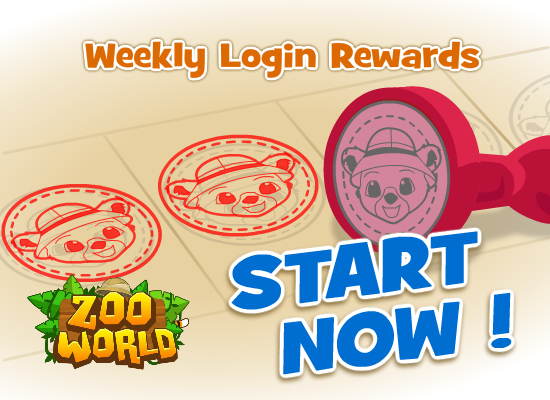 Login every day to collect a stamp and collect enough stamps to receive your reward! Don’t worry too much if you have missed one, you can buy the stamp using WLP! Moreover, you can purchase additional stamps for the same week by spending WLP to get ahead. You can also buy an extra animal to breed them! Login now to collect your reward! This entry was posted in New Features and tagged Animals, New Animals, new feature, rewards, stamp, Ultra Rare, Ultra Rares, weekly login reward. Bookmark the permalink.